This image of ganglion cells, Müller cells and starburst amacrine cells in the human retina is from a patient suffering from retinitis pigmentosa (RP). This disease this patient suffered from slowly causes people affected with this disease to go blind and is a constant reminder to me of why we engage in our research. For some, this is a pretty, though abstract image created through a set of technologies called computational molecular phenotyping (CMP). 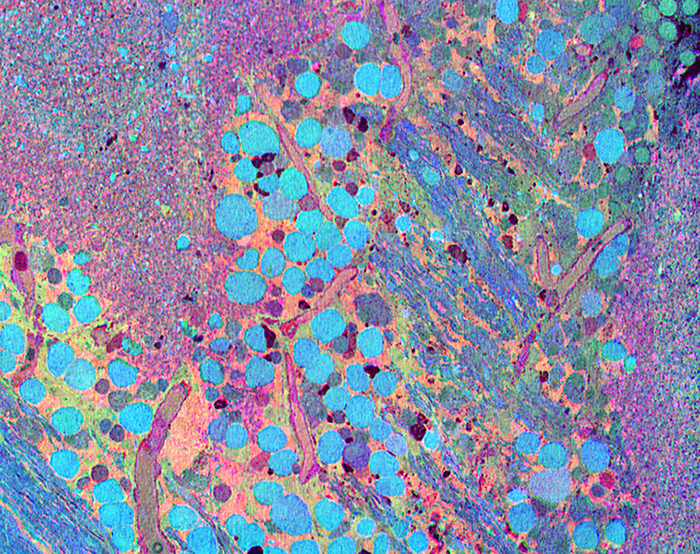 The colors in this image come from antibodies labeling taurine, glutamine and glutamate, all small molecular species that reveal metabolic states in these tissues. For us, these images reveal variation in cell types as well as abnormalities in other kinds of cells that presage retinal stress and the cellular responses that alter the retina in ways that both cause blindness and make it difficult to rescue vision loss. We also see the beginnings of changes in the circuitry of the retina that forever will alter the way that diseased retinas process information. It turns out that retinas are powerfully complex and highly parallel processing devices with precise circuit topologies that process visual information so we can see. Our work in understanding how retinas are wired, part of a new field called connectomics is only part of the problem as we start to unravel how retinas are constructed and how they alter their wiring in disease. Understanding how retinas are wired is a fundamentally important area of science. These retinas have evolved over 200-500 million years to be refined and energy efficient signal processing devices unmatched by silicon semiconductors. While the basic science aspects of this work are compelling and the human application to disease in neuroscience and biomedicine are intrinsically motivating, for those that are more economically motivated, there are a number of direct and immediate economic benefits from work like this on biologically informed computing. I am putting together a number of images like this for a grant I am writing to understand how this disease process alters circuitry of the retina. Wish me luck as the current funding climate, especially after the sequestration of 2013 is making science in this country a much more difficult environment to continue discovery and its impact on biomedical research is going to be brutal. Good luck with the grant Bryan! Thanks man. In this funding climate, we are all gonna need some luck to keep the wheels on the bus.